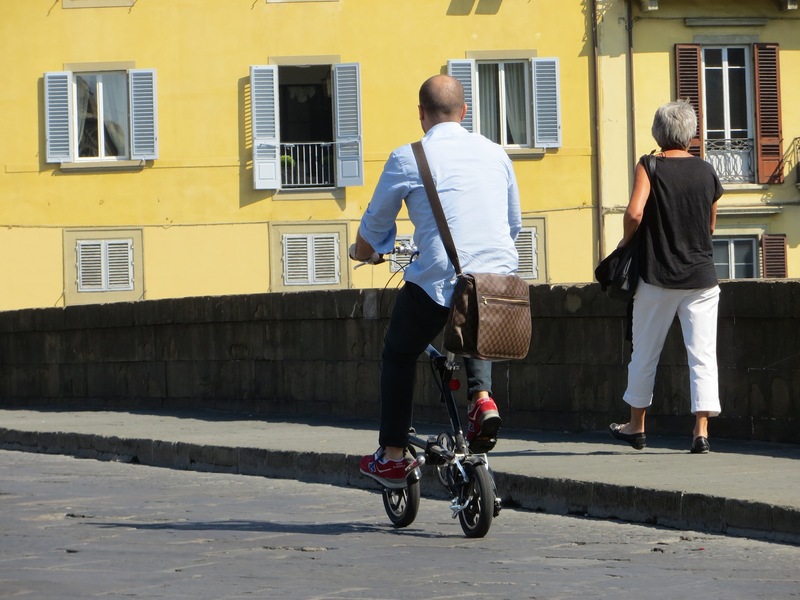 This was the second time I’d seen a Nanoo folding bicycle in Florence, Italy–or anywhere else for that matter. The first was in the bike shop down the street and around the corner from my base of operations at the Hotel Adler. And while I don’t remember the name of the bike shop, I do remember the gelato stand was closer to the hotel while the wine shop was closer to the bike shop. Not a lot of information on the Nanoo out in Internet land, mostly videos. 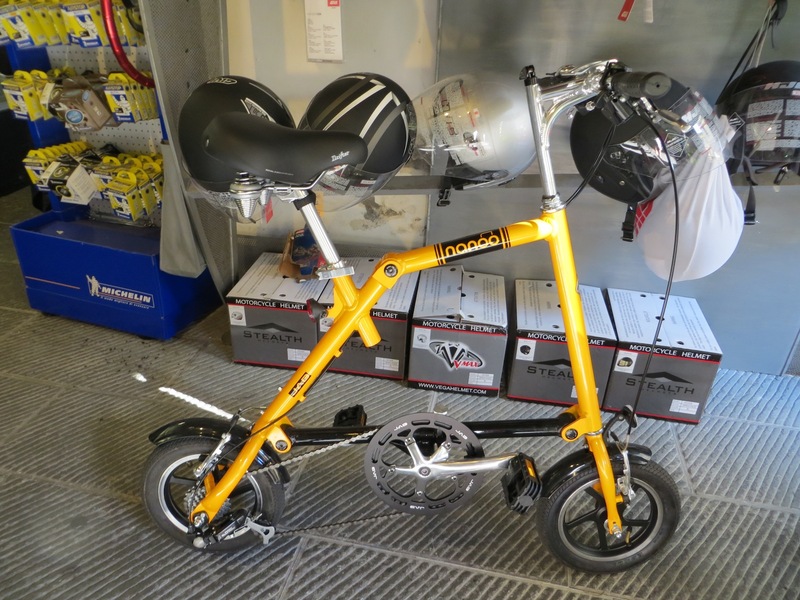 However, the videos do a good job of showing the fold, which transforms the bicycle from a mostly horizontal quadrilateral (left, above) to a slightly shorter vertical arrangement. 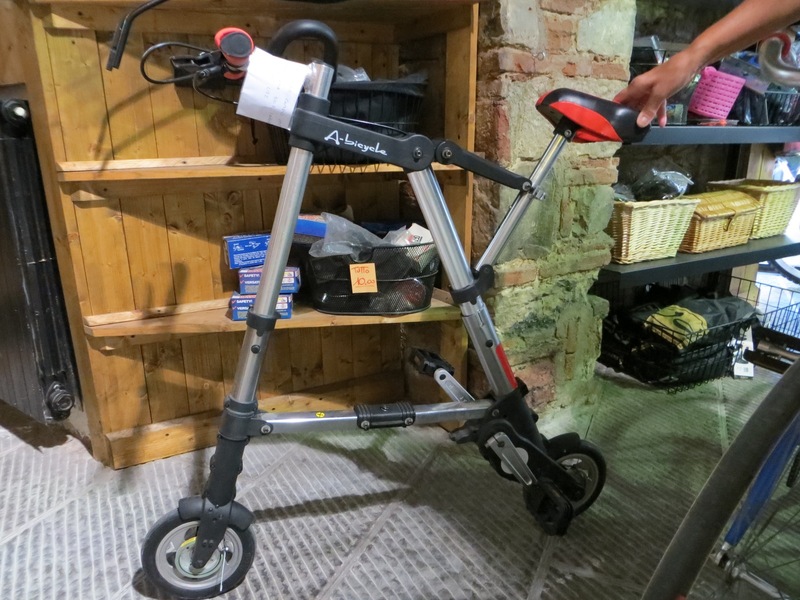 Folded, the Nanoo has a greatly reduced wheelbase, but the rest of the package still extends up to your waist. So, if you saw 12-inch wheels and thought to yourself, hmm, it must fold down to nearly nothing, uh, no. But it does look like it would be easy to fit into a small closet, or to bring onto public transit if you’re straphanging with one hand and holding the bike in front of you with the other. It doesn’t appear to be impossible to ride, either. 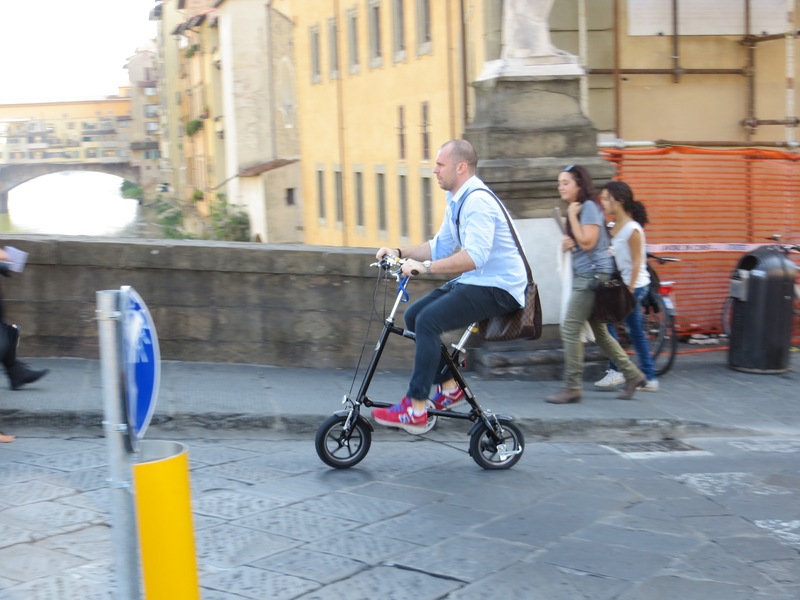 This entry was posted in Other bicycles, Report from the road and tagged Florence, Italy, Nanoo, Sinclair A-Bike. Bookmark the permalink. Interesting – I see all kinds of possibilities except speed, but then we’re always dealing with trade-offs aren’t we? I think that’s why I like folders. It’s interesting to see how makers manage the trade offs–and what they optimize: folding, riding or, in the case of the Sinclair, credulity.